Translate.Net is free and open source client to many translating services available online (translators, monolingual and bilingual dictionaries). Translate.Net is designed with a smart user interface to allow use different services from a single place. 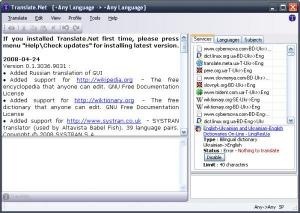 In comparison with locally installed dictionaries and translators, Translate.Net shows reduced requirements for hard drive memory.